Photograph of Dan Rostenkowski as a child distributing packages with his father, Joe Rostenkowski. 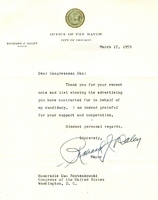 Letter from Richard J. Daley to Dan Rostenkowski thanking him for his campaign support. Dan Rostenkowski at St. John's Military Academy. Association Management-"The Tax Man Cometh," issue on Rostenkowski as Chairman of Way and Means Committee. 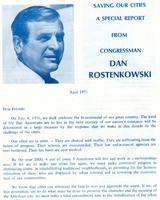 "Saving Our Cities Special Report," newsletter from Dan Rostenkowski to his 8th district constituents. 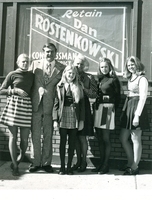 Rostenkowski Family at district office during reelection campaign.